Pink marble is more than pretty, especially when you pay attention to it in Knoxville. This East Tennessee city offers plenty of reasons for a visit and Cultural Heritage TravelingMom recommends following the Pink Marble Trail for extra pleasures. 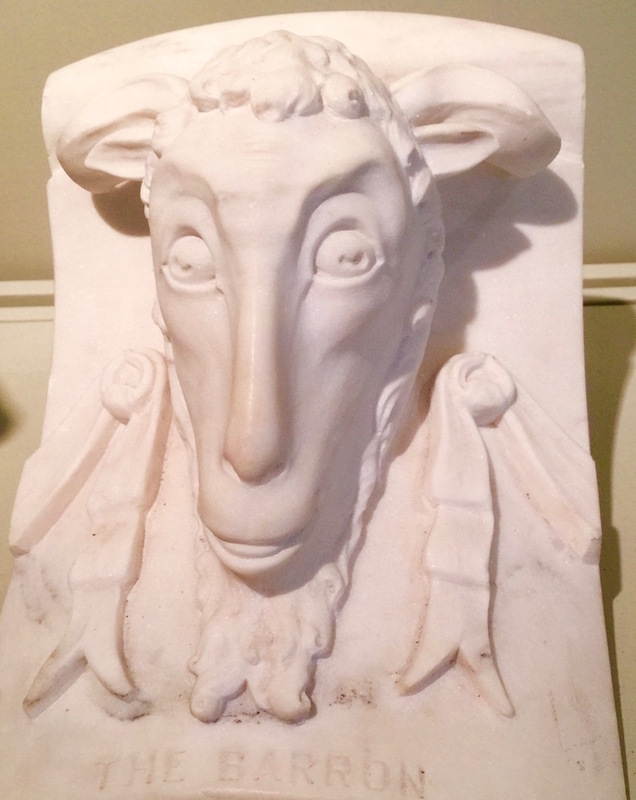 The Pink Marble Trail is whimsical as well as solid with history and culture. Photo courtesy Molly Gilbert. I’m in a bit of a rush to return to New York City and the public library now that I followed Knoxville, Tennessee’s Pink Marble Trail. This is a real-deal 34-mile loop with a brochure and website. Why New York? I’m pretty sure those majestic library lions will wink at me. They’ll know I experienced the Tennessee Pink Marble Trail. Quarries in Knoxville provided the lion’s sculpting material. I like connecting people and places – and the things which influence them. Exploring Knoxville with the intention to find all the pink marble possible gave my visit a focus and I’m pretty sure that I saw way more than I might have just ambling along. 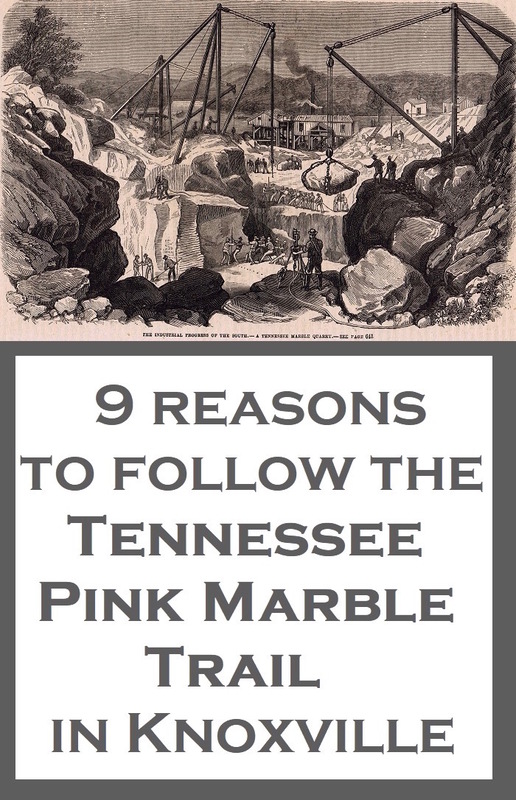 Think these 9 reasons why you should visit Knoxville and follow the Pink Marble Trail could entice you too? Knoxville’s shops, restaurants, and imposing government buildings feature pink marble, so create a scavenger hunt. Spot marble on the way to lunch, in the midst of public art and gardens, entering shops and museums. Urban Wilderness is a real destination title in Knoxville, and I found it lively, just like the city center. Long-closed marble quarry sites added to my forest discoveries, and one of many reasons to visit Knoxville. Pink marble crops up on trails connecting 50 miles of green space to 10 parks and four Civil War sites just two miles from downtown. On the South Loop Trail, I chose from four trailheads. Along my way? 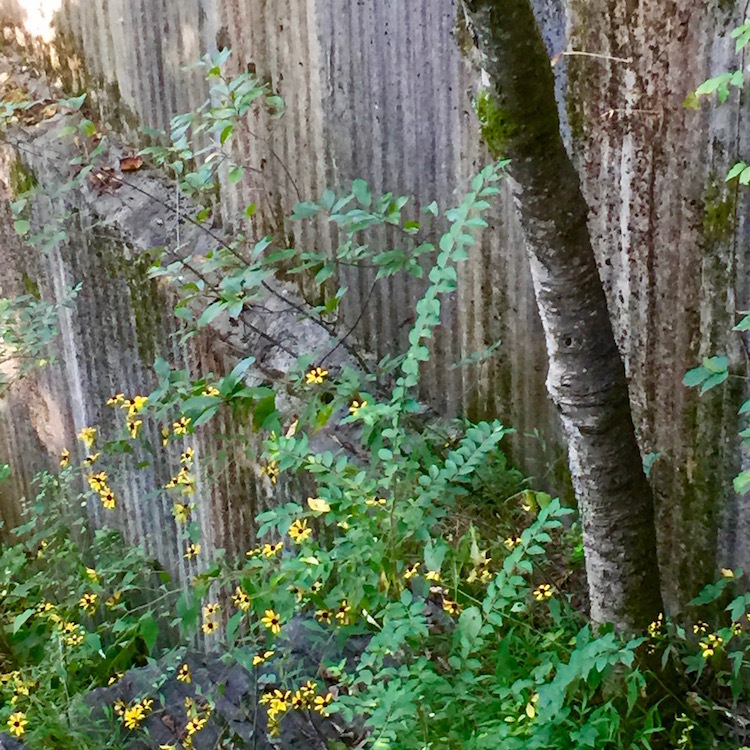 Clear signage, mature hardwood forests and marble extraction sites — plus wildflowers just like those in the Smoky Mountains. Follow the Pink Marble Trail via a hike into Knoxville’s nature center from the South Loop Trail of the Urban Wilderness. Drive-in approaches too. Two marble quarries noted on the National Register are on the Ijams Nature Center grounds, and so are birding boardwalks, canoes, paddleboards, canoes and bicycles, 10 miles of trails, an art gallery, interactive nature exhibits and a canopy tour with 60 elements. The broad pink marble wall of the Museum of Art caught my eye at least a block away. More marble evidence is inside, with discoveries of artists living and working in East Tennessee. Pink marble pops up in the 1859 painting by James Cameron named “Belle Isle from Lyons View,” and four exquisite portraits by Catherine Wiley who was born in 1879. I had trouble pulling myself away from this enormous installation of individually blown and cast glass. Try your own version of glass blowing by taking a class with Matt Salley at – guess where – Marble City Glassworks. “You’re standing on a vein of pink marble in this studio,” says Salley. His house next door to the studio was once the home of a president of Candoro Marble Company and that’s a dynamic part of the history – and visiting this stop when travelers follow the Pink Marble Trail. After a long hiatus, the handsome showroom from the height of quarrying and design work is open for free Sunday afternoon tours, April through October. In addition to carved marble baseboards and trim, marble cornice boards and patterned marble floors, look for tools belonging to Italian master sculptor Albert Milani. He was Candoro foreman for 40 years. 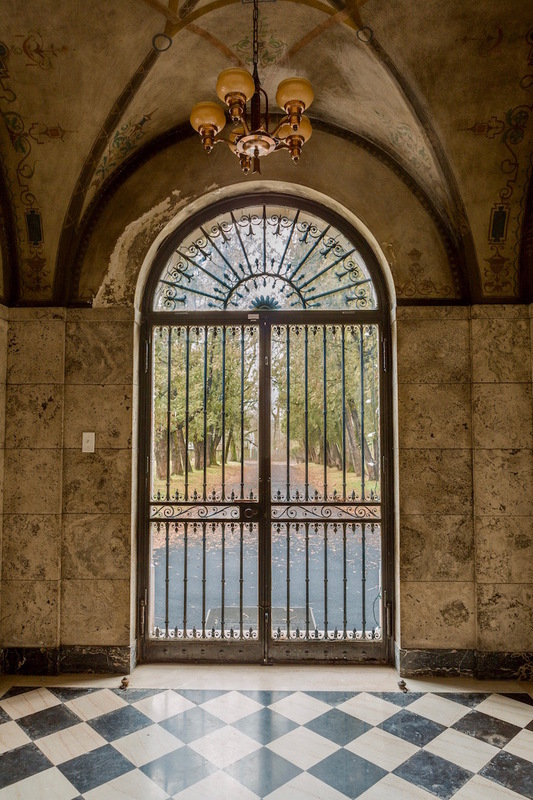 Pink marble forms the exterior with wrought-iron doors and transom by master iron designer Samuel Yellin. The spelling is tricky: candora is an Italian marble and candoro is a manufactured word from letters in the names of the company founders. 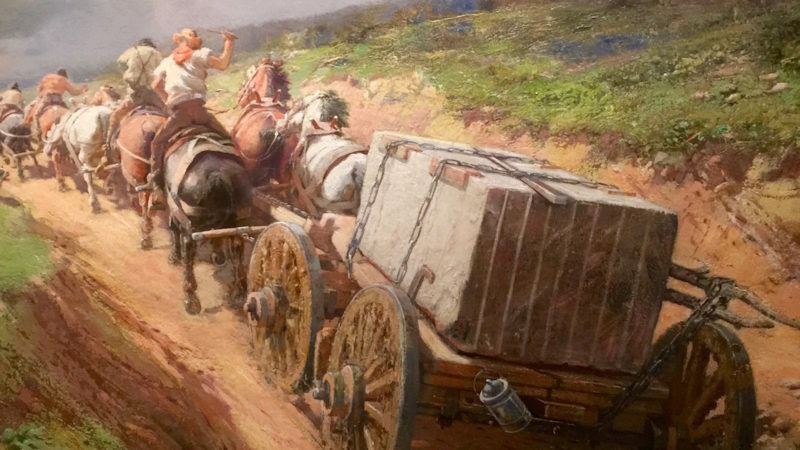 A reproduction of the Lloyd Branson painting “Hauling Marble” is here too; the original hangs in the Knoxville Museum of Art. Music and fine crafts, storytelling and fine art abound in this part of Tennessee and always have. Historian Cherel B. Henderson, director of the East Tennessee Historical Society’s exceptionally fine museum, knows the difference between the public perception of a hillbilly culture and abundant evidence of skilled artisans. The History Center staged a temporary exhibit in 2016 and part of 2017 called “Rock of Ages.” Many items are on display in the permanent collection, including tools and a long panoramic photographic of several train cars loaded with huge chunks of marble. 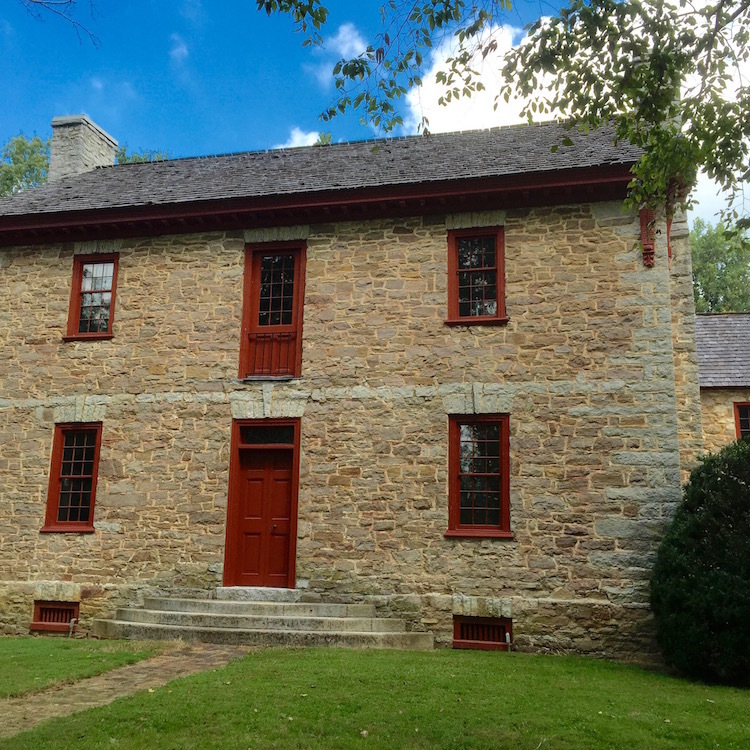 Marble Springs State Historic Site and the 1797 Ramsey House provide layers of interest, including their tie to the marble. Consider them highlights along the Pink Marble Trail. Gaze awhile from the front lawn toward the two-story Ramsey House because it is all pink marble with blue limestone, considered Tennessee’s first home to be architecturally designed. British architect Thomas Hope left Charleston, South Carolina and braved the frontier to design the home, including a most surprising-for-the-times attached kitchen. Period furnishings engaged me but the exterior tells a marble story. Large, irregular, rough blocks of marble form the main walls while the belt course midway and flat arches above the windows are Knoxville blue limestone. Keystone protrudes more than the line of nine wedge-shaped rocks that diminish in size as they reach toward the sides of the house. Ramsey House makes great use of its lawns and meadows with special events all year long: storytelling, Civil War-era baseball, Jane Austin literary gatherings and English country dancing. Historic art, functional architecture and boundless stories fuel the Pink Marble Trail. 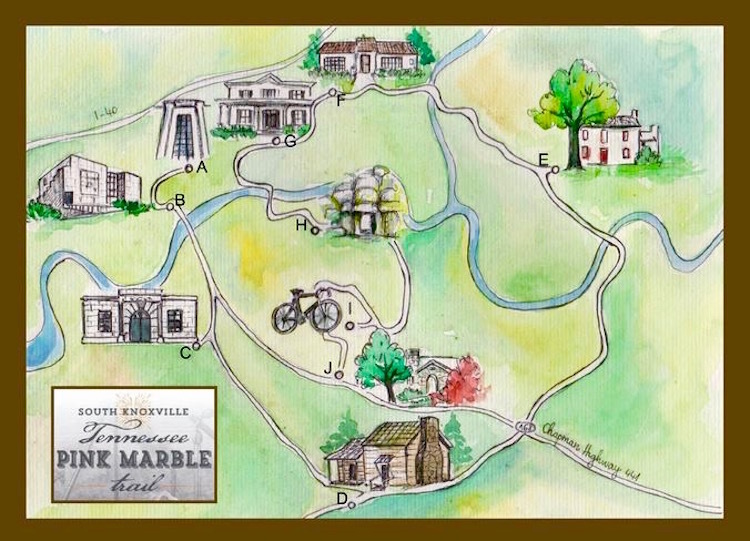 Marble Springs, a state historic site, so named for deposits of Tennessee rose marble, provides 35 acres of historic buildings, connecting lawns and gardens and a one-mile walking trail. The main cabin built circa 1800 stands in its original spot, and was the last home of Tennessee’s first governor, John Sevier. Descendants show up at least once a month, says Executive Director Anna Chappelle. “Log structures are fast disappearing,” Chappelle notes so finding five here is a bonus. So are the pink marble steps to get inside the Sevier home. The Marble Springs loom house features a rare rocker-beater loom, hand-crafted shortly after the American Revolution. Flax was grown here, not cotton, and still is for demonstrations. I liked the herb garden info about Sevier’s treatment for rheumatoid arthritis: a boiled earthworm poultice. Hope for a stargazing special event when you visit because the skies over Marble Springs provide a stage free of city lights — and offer more reasons to visit Knoxville and follow the Pink Marble Trail. When you’re ready for a vacation in Washington DC, look for Tennessee Pink Marble at the National Gallery of Art and the U.S. Capitol. In New York City, after the Public Library lions, check out the terminal floor at Grand Central Station. Enjoyed your article, and have been to most places mentioned. 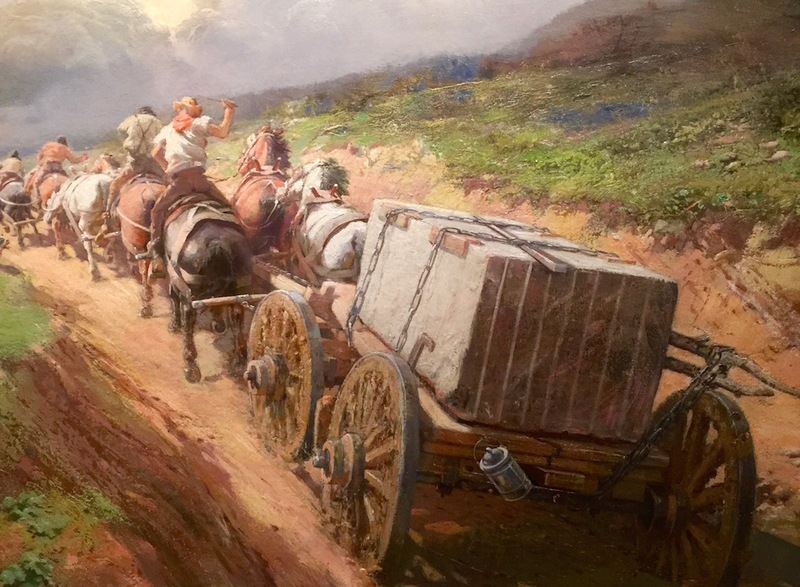 The “Hauling Marble’ painting by Lloyd Branson that was featured is actually owned by the McClung Museum of Natural History and Culture, and is on loan to the KMA. How very kind of the McClung to loan this handsome, significant piece of art to the museum with a pink marble exterior wall! Donors should receive credit and I am sorry I did not share that fact. I do appreciate readers with an eye for detail and accuracy. Thank you.